And then, some-body does. The One whom Mary thinks is a gardener now asks the personal, incarnational, body-question: “For whom are you looking?” And then, this One who created the world with but a word, now brings salvation to Mary, by simply calling her name. Jesus says to her in Hebrew: ‘Mariam!’ And immediately recognizing the voice of her teacher (cf. John 10:3-4), Mary exclaims: ‘Rabboni!” In six short syllables, “Ma-ri-am” and “Rab-bo-ni” … and in just about that many seconds … the world became a different place, for Mary, for you, and for all people. Death, once final, has met its match and is un-done. There is a reality – SOME-BODY – more final than death. 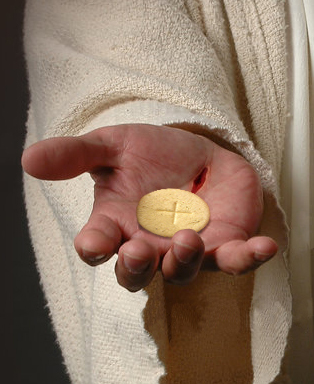 “This is my body,” says Jesus, “given for you” (I Corinthians 11:24). The Word is out! And yes, it’s for you, always …!